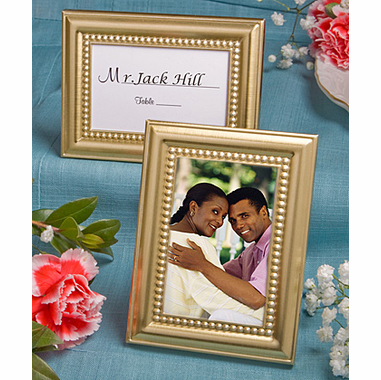 Our Golden Anniversary Placecard Frames will be a welcome sight at your guest's place settings! 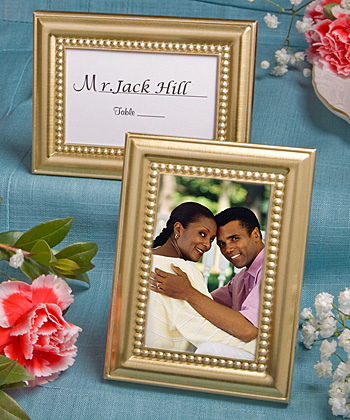 While you are planning the perfect Golden Anniversary party, you can accent the event tables with an elegant and versatile gold tone metal placecard/photo frames with a picture of the honored couple, and afterward your guests will have a loving reminder of the special time you spent together! These are perfect favors for a Golden Anniversary or 50th Anniversary party, super affordable prom favors or lovely for wedding placecard use as well! The Golden Anniversary Placecard Frames are a favor that can be used both at your event and for many years after are versatile choices that offer a great value. And, when you combine all of that with the beauty and elegance of this lovely frame, you have a winner! Each matte gold metal frame measures 2 ?? x 3 ?? and features an beautiful beaded design border and a central glass covered opening for displaying a 2? x 3? picture or place card. The back of the frame is black velvet with a hinged opening for easy insertion and an easel cut to enable you to stand the frame either vertically or horizontally. Sure to be a crowd pleaser, each frame comes packaged in a white box with blank place card included.